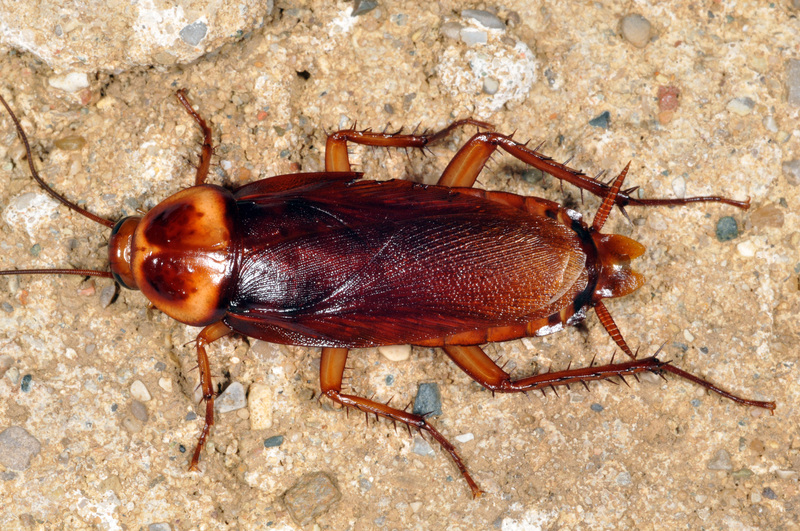 There are five kinds of cockroaches commonly found in Indiana. They vary somewhat in appearance and habits, but in general they are all rather large, flattened insects, brownish or dark in color and fast moving. 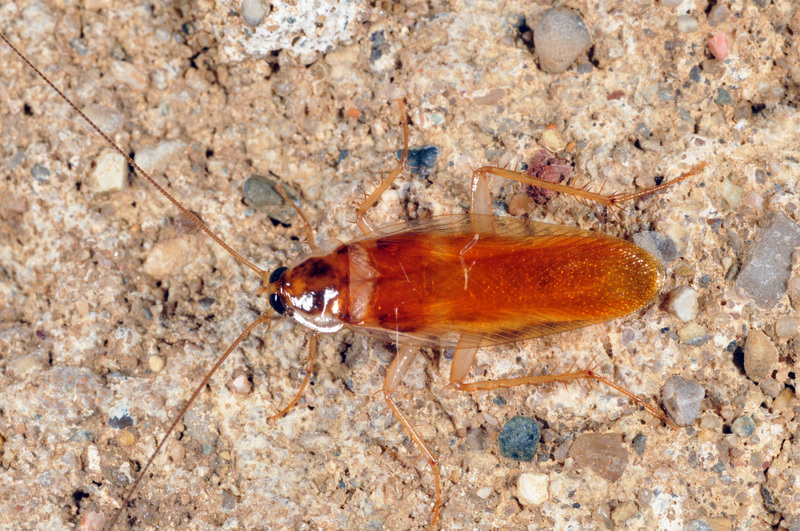 Roaches seek concealment in the daytime and also when disturbed at night. They may be carried into homes in boxes, egg cartons, beverage cases and produce such as potatoes. In apartments and other large buildings, they readily migrate from one place to another along water pipes. 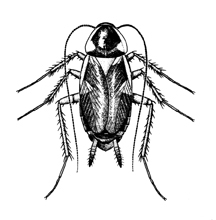 The German roach is a very common species and the one usually found in kitchens. The adults are comparatively small (about 1/2 inch long), tan in color and often occur in large numbers. The immatures (nymphs) have dark markings which make them appear dark brown to black. 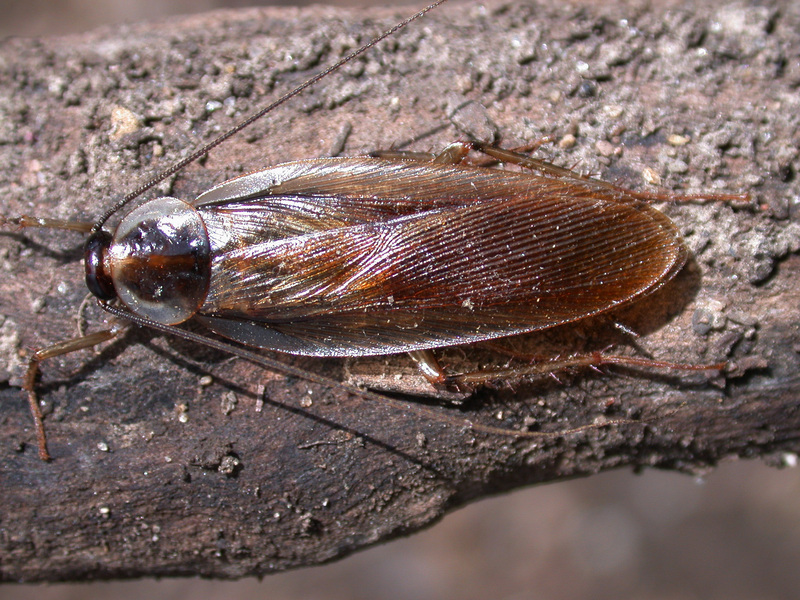 The American roach is reddish-brown and is the largest of the common roaches (about 1-1/2 inches in length at maturity). It is found more often in food establishments, although houses and apartments near such establishments frequently become infested. 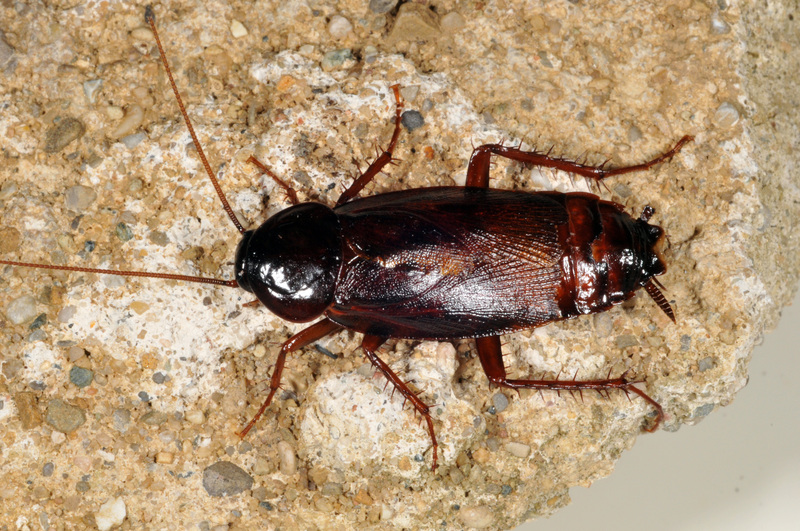 The Oriental roach is also large (about 1 inch in length) and shiny black or very dark brown. 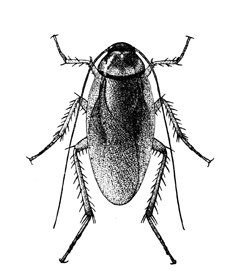 It is often called a “water bug” or “black beetle.” This species is frequently found in dampness and may enter homes through sewer openings. It may likewise live outdoors during the summer months and move from home to home. The Brown-banded roach is a southern species but is often found in Indiana. It resembles the German roach in size but differs in habits. It may infest the entire home, rather than confining itself to the kitchen or where there is food. Infestations usually start from luggage, furniture or other materials shipped from one place to another. 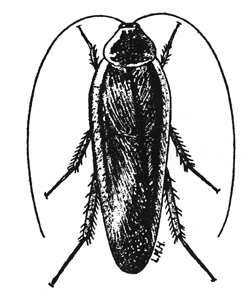 The Woods roach normally lives under the loose bark of dead trees, logs or stumps. It sometimes invades homes built in or near wooded areas, but it does not thrive indoors. Males are nearly 1 inch long and dark brown with a pale stripe on the outer margins of the wings. They are fairly good fliers and often enter homes this way. They can also be carried in on firewood. 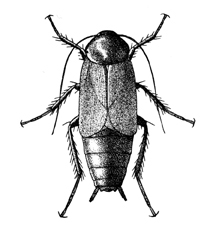 The females are short-winged and resemble the Oriental roach, but they are seldom found indoors. 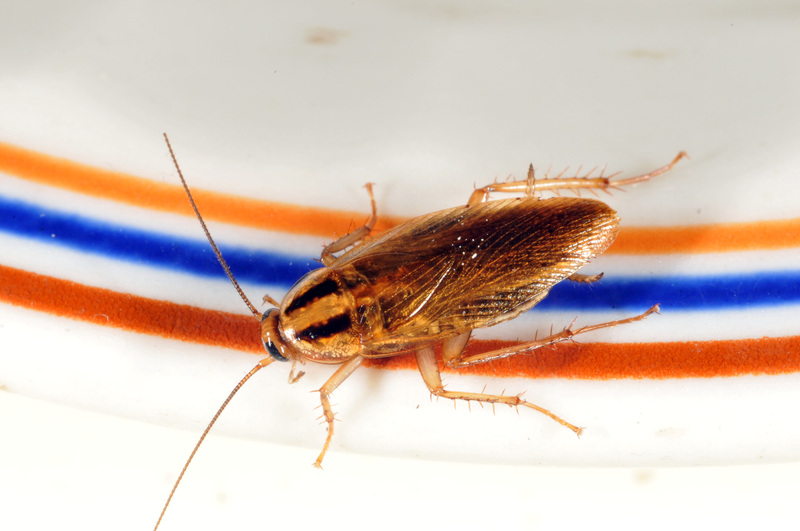 The chances of effective, lasting cockroach control are greatly increased if thorough sanitation preceeds proper chemical application. The destruction of breeding places (by clearing out garbage and clutter, sealing cracks and openings, etc.) and the removal of food and water sources may reduce the necessity for chemical applications. 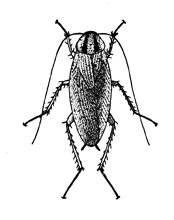 There are a number of insecticides, and usually numerous formulations and ways of applying each insecticide, that may be used for cockroach control. Baits and sprays (labelled as crawling insect control materials) are the most effective. Dusts or powders are also available, but are more difficult to use. Traps (with a sticky substance inside) can be purchased and used for pinpointing areas where cockroaches are located, but usually have to be combined with baits or sprays to obtain satisfactory cockroach control. Baits are easy to use, and are best for areas where contamination with sprays or dusts might be a problem, such as near food or dishes. Cockroach control materials are now available in low-pressure spray containers (aerosol cans) that apply a residual deposit of the insecticide. Apply them in about 2” wide bands where cockroaches hide, such as in crevices near the kitchen sink and stove, underneath and inside cupboards, around pipes and conduits where they pass along or through walls, in and around water heaters, inside the motor compartment of refrigerators, and behind skirting boards, mirrors, and pictures. Also, treat garbage cans and other refuse containers. Pressurized sprays of this type are quite satisfactory. However, they should not be confused with the high-pressure “aerosol bombs” (total release aerosols) designed for applying space sprays. The latter are of limited use in cockroach control, with the additional disadvantage that occupants must evacuate the premises while treatment is underway, and without proper precautions some can start fires. A number of electronic/ultrasonic devices that are supposed to kill or repel cockroaches are now being sold. Most of these devices have not been tested thoroughly enough to determine if they are effective. A number of these units have been removed from the marketplace by government agencies after they were found to have no effect on insect pests. Woods cockroaches — Parcoblatta spp.